Description: A snap is fun, but a magnetic snap adds a whole new layer of possibilities. 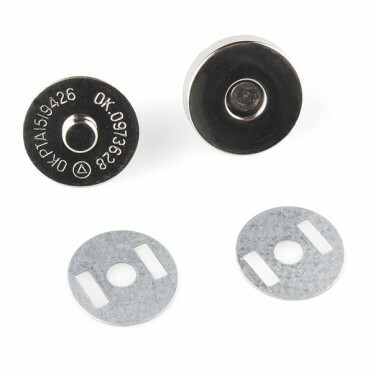 This are relatively large 18mm diameter snaps (all three pieces come as shown). They couple together very strongly (must be pried apart), rotate freely on the axis, and are electrically conductive. We've seen snaps like these soldered onto PCBs and batteries to form a strong, but quick disconnect mechanism. Overall connection resistance is less than 200 miliOhm. Snaps will couple when closer than 10mm.